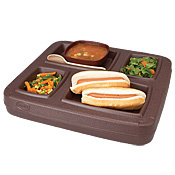 Available in traditional four compartment or new five compartment layouts. Five compartment layout features a 3/4 height divider in one large compartment to separate bread from other food, keeping the bread dry and fresh while the smaller side compartment will accommodate a 4 oz. portion. Both layouts can be stacked together and are the same overall dimension. One Piece Construction - no seams to split or crack. Increased Durability - 25% thicker skin than other trays on the market. Better Design - trays seal tighter because of Cook's two step design. Top and bottom surfaces nest securely so trays will be flat & stack up straight improving heat retention of meals and food safety. Immediate Availability - Quick Ship includes large quantity orders that can ship out same day.